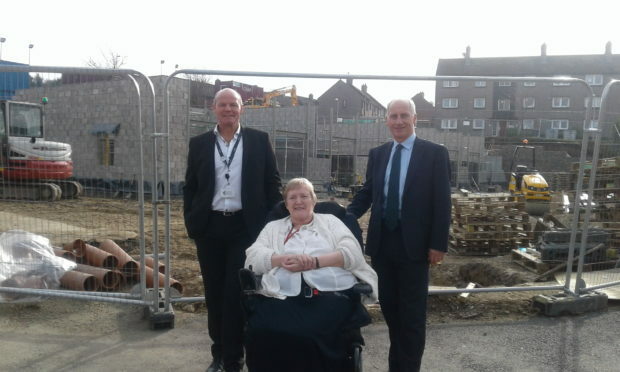 Tom Gilchrist, Jean Kemp and Trevor Garlick at Dee View Court in Aberdeen. The Aberdeen branch of a multinational energy company has pledged to raise £100,000 to help the country’s only specialist neurological centre. And the mission to boost Sue Ryder Dee View Court in Kincorth has a very special poignancy for Tom Gilchrist, senior vice-president of operations and maintenance for Europe and Asi at Wood. Just a few months ago, his brother, Will, died from a brain condition and Mr Gilchrist is determined to honour his memory by making sure that Dee View Court, which currently looks after 24 residents, can bring to fruition its £3.9million expansion, which will nearly double its capacity. The charity has so far raised more than £2.8m, and construction work has already started on the extension. Mr Gilchrist said: “In December last year, we lost Will to a brain stem stroke and this has made me doubly determined to raise the cash which is needed for this very worthy centre. “It is a place that, if Will had survived, he might have needed. So I have agreed to take part in lots of activities in 2019 – abseiling, a 26-mile kilt walk and a cycling event. The centre provides round-the-clock care to people with a range of conditions, including Huntington’s disease, severe stroke, acquired brain injury and Parkinson’s disease. Its staff are now looking forward to welcoming the Wood daredevils to their next hair-raising challenge; an abseil down the Aberdeen Exhibition and Conference Centre’s Northern Lights tower on April 20. Valerie Maxwell, the centre director of Dee View Court, said she was delighted by Mr Gilchrist’s initiative. She added: “The Wood team is planning some fantastic work that will help to raise awareness and funds for Sue Ryder’s work in the community. We are really looking forward to supporting their amazing efforts. The campaign, which was launched in the summer of 2017, is moving closer to achieving its target as demand for the centre remains high. It’s hoped the expansion will be complete by autumn this year.